At the heart of the BUKC are the Team Championships. Teams of 4 drivers race together and do battle against other universities on the finest fleet of “arrive-and-drive” karts and at some of the best race tracks in the country. There are two main championships in the BUKC. The Premier Class and Intermediate Class. To race in either of the two main championships, all drivers must have a BUKC Race Licence and all teams must qualify at the Qualifiers. To gain a BUKC Race Licence you must attend a test day and be deemed fast enough and safe enough to race. For drivers who haven't obtiained a BUKC Race Licence there is the Rookie Series. Every driver new to the BUKC must attend at least one test day in order to obtain their BUKC Race Licence. The Premier Class is the heart of competitive racing in the BUKC with a format designed to test driving skill and team work as well. The Intermediate Class is for teams who are either reasonably new to the BUKC or who don’t yet have the experience to qualify for the Premier Class. The format of the racing is more relaxed and maximised for the safety of the many new drivers and teams each year. The Rookie Series is for those drivers who have not yet obtained their BUKC race licence. The emphasis is on testing with feedback provided our race instructors. There is a small race for each driver at the end of the day to give them a feel for racing. Drivers who are deemed competent enough by the end of the day will be awarded their BUKC Race Licence! A yearly one off special event for drivers to forget about being team mates for a day and race to become the BUKC Drivers Champion! Of course you want to keep racing after graduating! For 2018, the BUKC Grads Champ is open to BUKC drivers who graduated in 2015 to 2018. 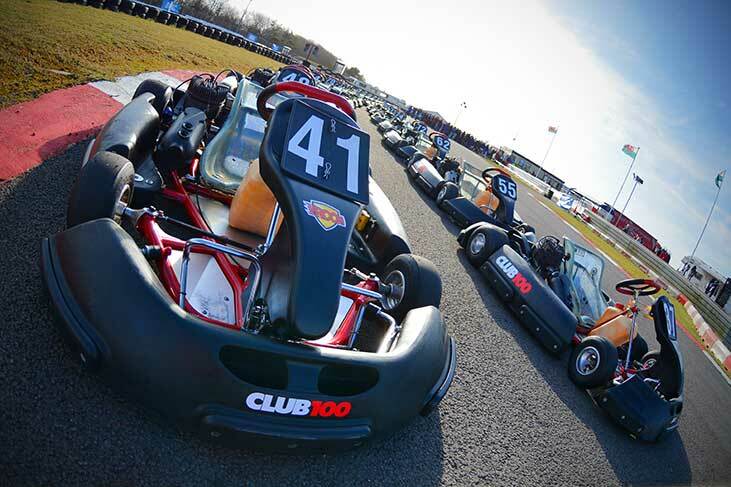 The karts used in the BUKC are simply the finest fleet of “arrive-and-drive” karts in the world. They are nothing like the normal indoor or outdoor karts that many are used to. This is a proper racing fleet which can accelerate from 5 to 60mph in 4.5 seconds and can achieve a top speed of 70mph. If you have never been in a “2-stroke” kart before, you’ll never forget your first time! To take part in the BUKC you need to get in touch with your university's karting team captain.